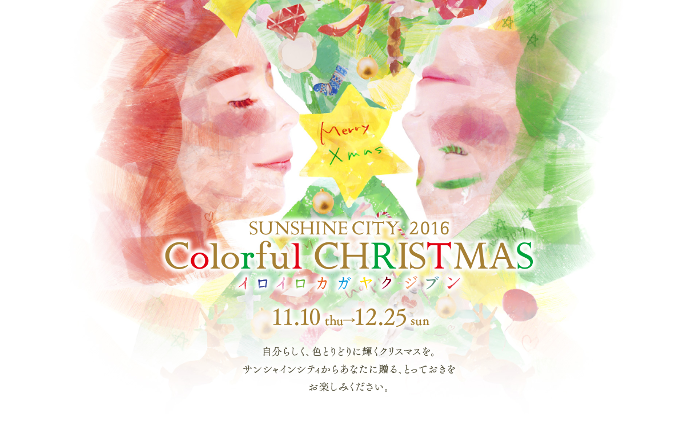 Christmas event to be held in Sunshine City, “SUNSHINE CITY COLORFUL CHRISTMAS”. 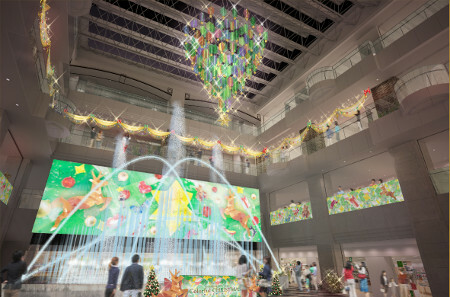 At Fountain Plaza, entitled “COLORFUL CHRISTMAS SHOW”, there will be a Christmas show where music collaborates with “fountain” using the space of the 4th floor, “illumination” object of light, “image” projecting on the large vision. The image will be created with illustrations by Yoshimoto Ayako, a popular illustrator who designed this year’s Christmas main visual. Christmas live also will be held at the Fountain Plaza on December 23 – 25. In addition, events that liven up Christmas will be held at such as Sunshine Aquarium and Observatory in Sunshine City. *Please use “More options” on the Map to find the optimal route. ※ The schedule of the fountain stage effect depends on the day. Please check the schedule on the official website.